You and your clients now have access to the security and convenience of an integrated electronic signature process through DocuSign. 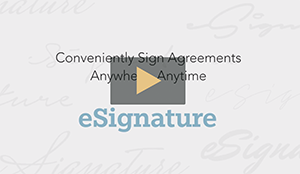 Conveniently sign contracts anytime, from anywhere, on any device. Streamline your workflow including quoting, providing payment options, and contract archiving all via an entirely paperless workflow. Reduce the time it takes to close business and significantly improve your service to your clients. Allow your client the ability to self-select their choice of payment methods, 24/7. Receive payments faster, reduce your receivables, and retain client relationships with the most efficient payment solution. View how simple it is for your client to accept and pay for their policy with our Paperless Payment Options.